From 2009-2011 I lived in Virginia. During my two years in one of the oldest states, I was introduced to a one pot meal that I had never heard of previously; brunswick stew. Upon eating and enjoying brunswick stew once or twice with a few of my native Virginia friends, I consulted my mother to ask if she had ever heard of this dish. Surprisingly she said, "Sure, that's something they ate in old colonial Williamsburg. I've got the Williamsburg cook book which I am pretty sure includes a recipe for brunswick stew." It wasn't until I graduated and moved away from Virginia that I found myself craving brunswick stew. So I decided to do some googling and found a few recipes that sounded familiar to what I had eaten. 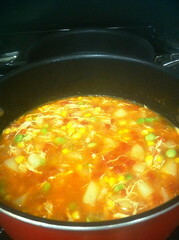 Searching around the house, I found variations of most of the ingredients required, and after a quick trip to the grocery store I was ready to begin the process of making my first brunswick stew. I was a little skeptical of how it would turn out, after all, the ingredients seemed too simple to create the same tasty flavor which I had experienced during my first few encounters with brunswick stew in Virginia. To my delight and surprise, the stew came out so well that I wouldn't even tweek the recipe for the next time I make it!